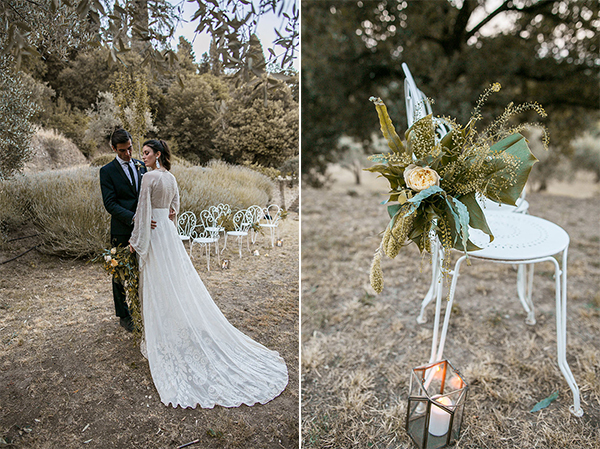 If you are dreaming of a rustic wedding with a green and yellow colour scheme, this beautiful inspiration shoot we are sharing today is perfect for you! 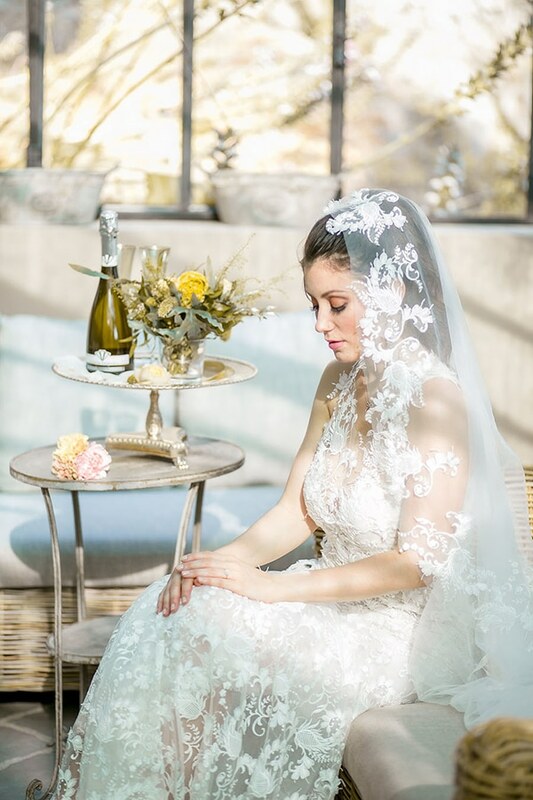 Villa le Fontanelle was the perfect setting for this gorgeous shoot featuring a gorgeous table setting, lovely details and two beautiful wedding dresses! 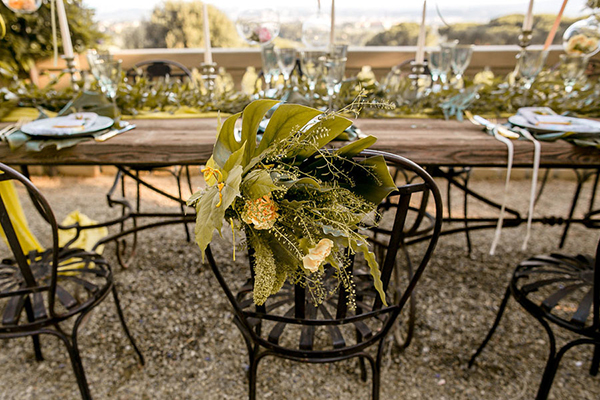 We loved the hanging tealight holders above the table and the gorgeous arrangements with orange and yellow flowers! 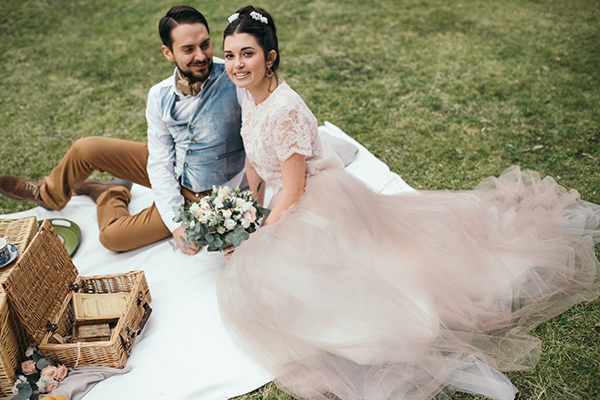 Have a look at the beautiful photos and get inspired for your big day! 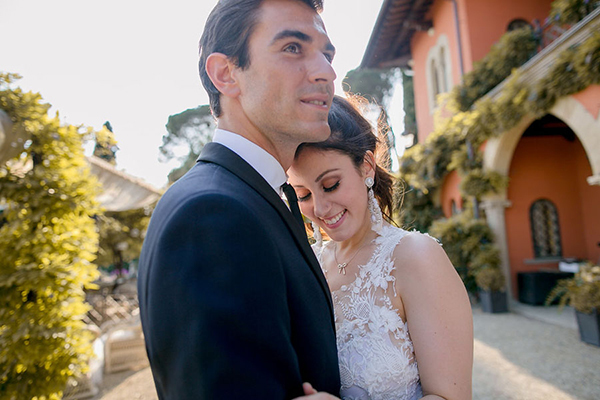 From The Tuscan Wedding: “Want to get married in Florence but don’t want the worry of a crowded city? 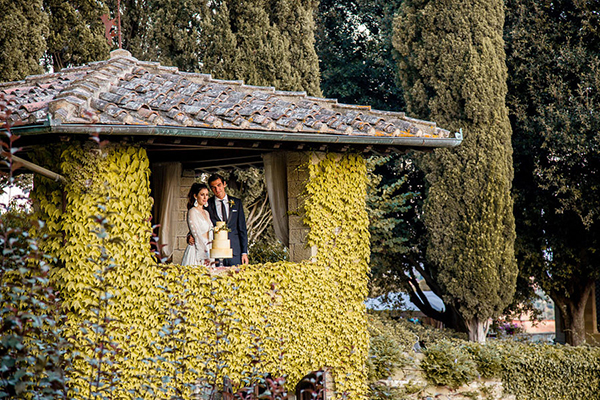 Villa le Fontanelle sounds like the perfect place for you. 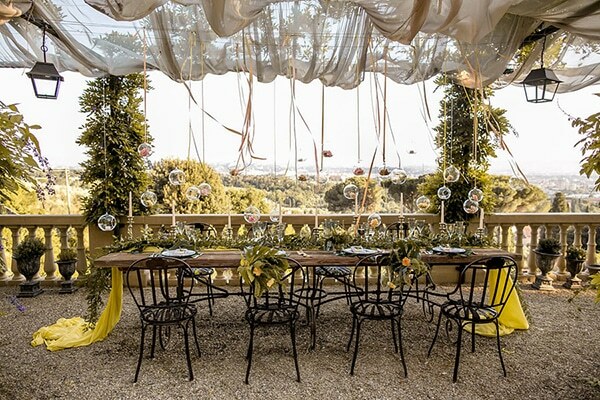 This beautiful villa is tucked away overlooking the city of Florence. 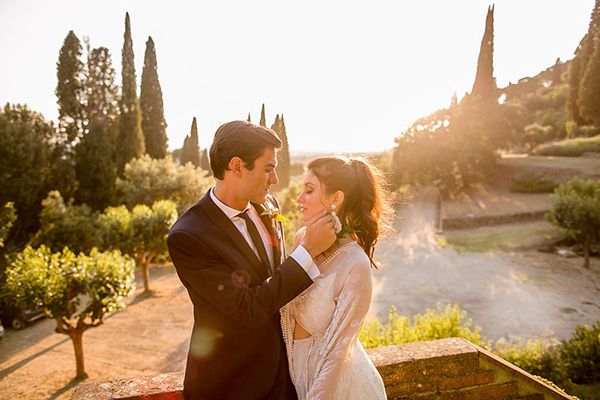 The grounds include a villa, fortress, and a beautiful garden. 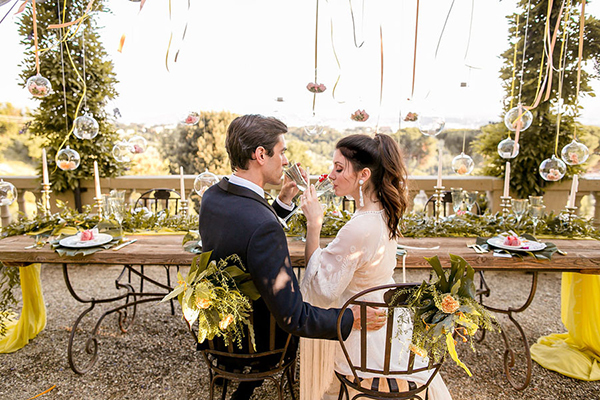 This was a great location for this shoot and it came out perfectly thanks to Storyett Photography, an excellent photographer the Tuscan Wedding enjoys working with. 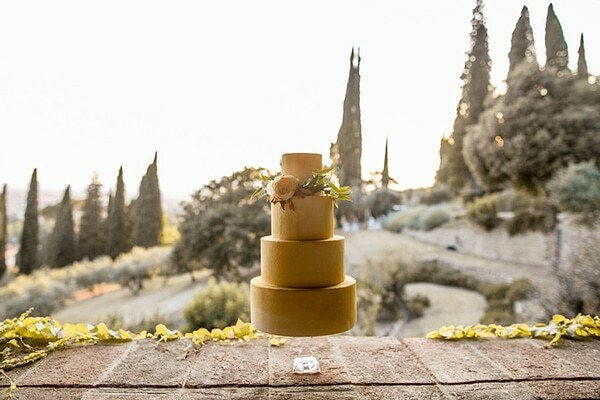 The Tuscan Wedding wanted to create a rustic, warm mood using many neutral colors such as yellows, greens, browns, and reds. They wanted this reddish color to pop and stand out. 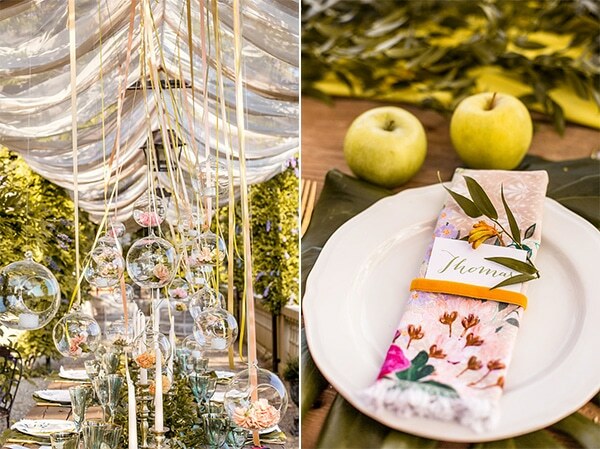 The table, the flowers, the table setting and even the venue stayed consistent with this color theme”. 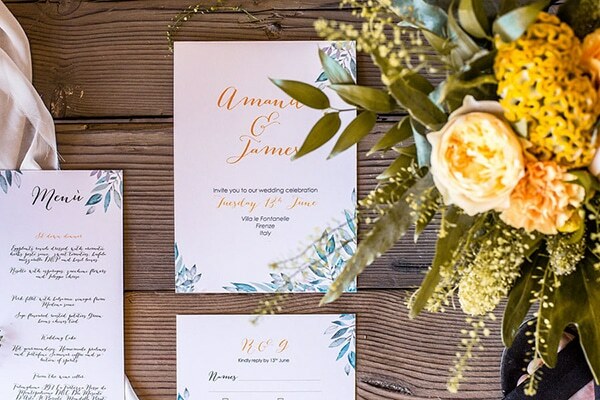 “On the side of each plate you can find two gold forks along with a silver knife all tied together with a ribbon. 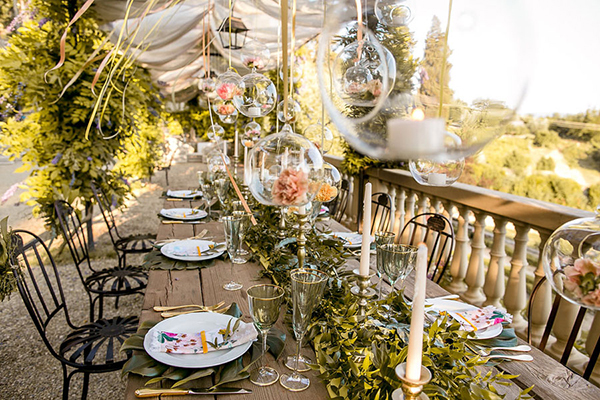 Three glasses with gold rims for each guest were also provided with small cherries lying on top. The table also contained thin white candles as well, and small green apples. 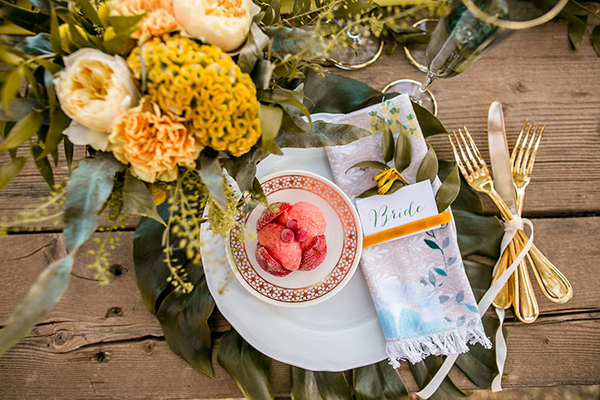 Bright red strawberry desserts were also present in this shoot, just as mentioned before this was the red color that “popped.” All of this went along with the color theme The Tuscan Wedding was aiming for, but that isn’t all”. 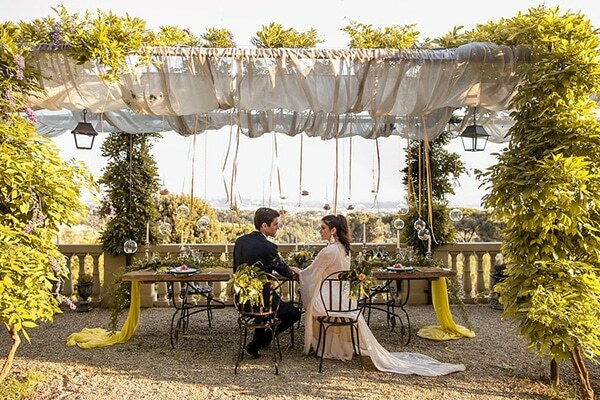 “Above the table draped an elegant white, sheer cloth. 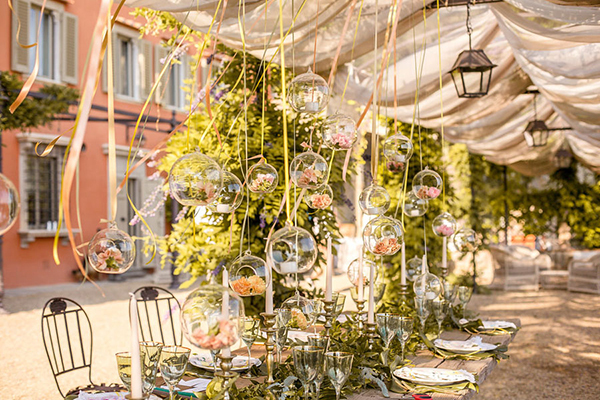 Hanging from this were glass bulbs filled with light pink flowers, these bulbs were attached with a yellow ribbon. 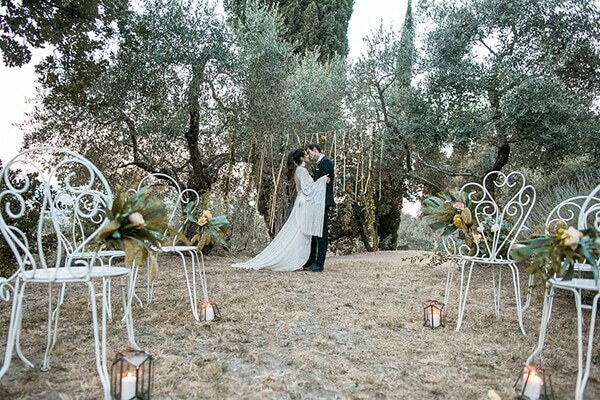 It is clear The Tuscan Wedding and the florist, Flowers Living, worked hard to be continuous with this rustic color theme. 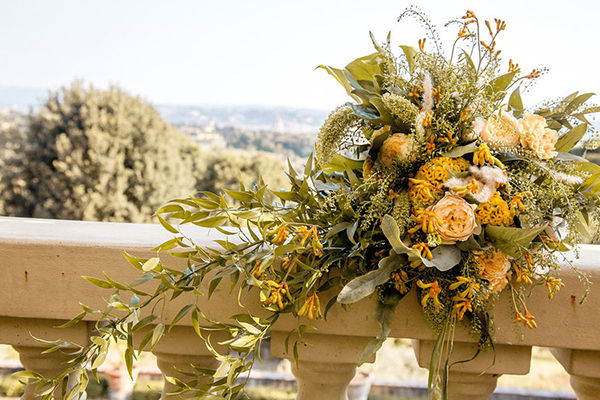 Flowers Living, a florist The Tuscan Wedding uses often never fails to impress them! 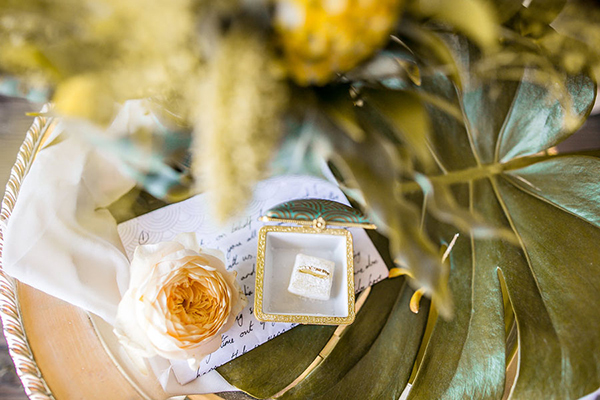 The bride’s bouquet is a perfect example; the bouquet contains lots of green with many small yellow accents along with yellow roses tied together by a yellow satin ribbon. 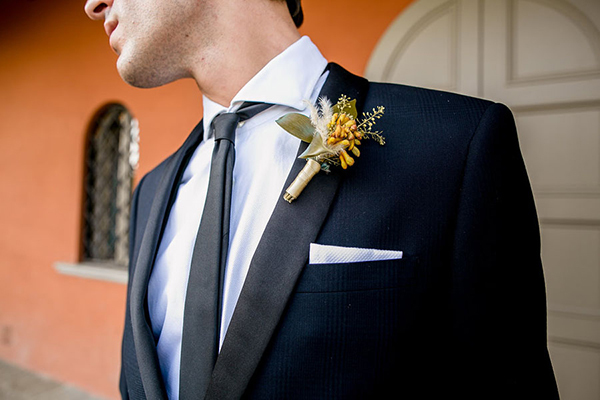 The boutonniere was yellow and green as well”. 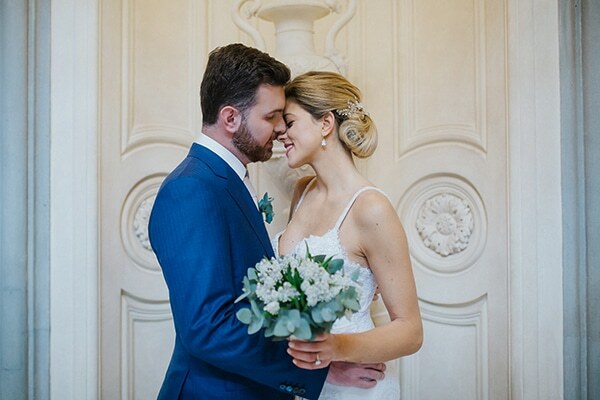 “The venue, bridal car and cake of course matched the theme of this day. 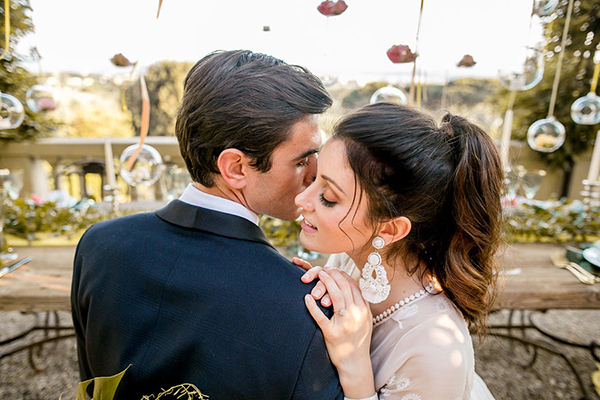 The venue was filled with greenery, and the side of the building shown in the shoot was bright red orange. This was perfect for the shoot; the wall popped and grabbed everyone’s attention just as the red accents throughout the shoot did. The side of the building contained arches as well covered in green veins that added to the rustic mood. 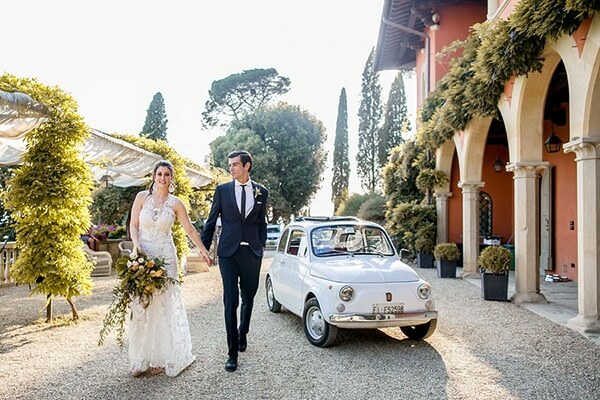 The bridal car was placed outside of this building; the bridal car was white with bright red seats inside. 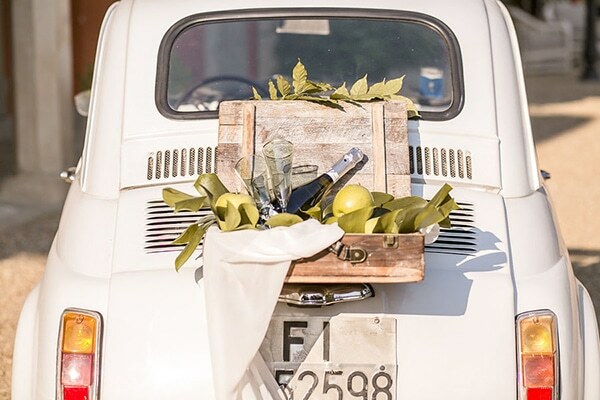 The back of the car carried a cute wooden basket filled with green leaves, champagne bottles and light green apples”.